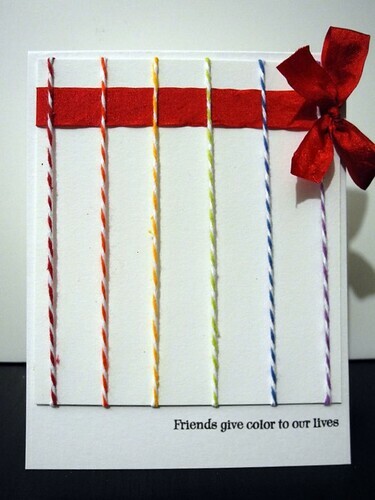 Just Jingle: Friends Give Color to Our Lives...and so does Twine. Just say'n. Friends Give Color to Our Lives...and so does Twine. Just say'n. WHAT? Can I not be friends with twine? Don't judge. HA! I really can't help loving the stuff, though. I just can't. Well, folks, it is the first Sketch Tuesday of 2012 over at Skipping Stones Design and we have an incredible line up for you this month! Our sketch artist for the month is Pamela Young, and our guest designers are Emily Leiphart, Julie Day, and Candice Fields! These girls rock! Here is the card I created with the sketch for today! Mmmmmm...yummy, yummy twine! HA! I told you we were friends. Just say'n. The sentiment is from the Healing Wings set that I love so very much! The sketch is absolutely fantastic, you guys! You really should check this one out! Don't forget to play along and link up your card this week for a chance to win FREE Skipping Stones Stamps! You don't have to use SSD stamps to win, but we love it when you do! I am feeling a bit better today, but only a bit and I'm back at work for the week, so I suspect exhaustion to be the theme of the day, but I can handle that, I guess. I mean, I DID get a Hello Kitty Snuggie for Christmas, so at least I have something to look forward to when I get home! HA! I hope you have a super fantastic Tuesday and...Welcome to 2012!!!!! Happy New Year! Such a fun and uplifting card! Hope you feel better soon! Very cool! Love the splash of red with the ribbon. you and Wendy are on the same color wavelength!! love it Jingle!! What a fun, simple card! Glad that you are feeling better....you need to post a photo of you in the Hello Kitty Snuggie! And a belated Happy Anniversary! fun card...love all the twine..
omgosh! I LOVE how you used the twine! Brilliant! Great card! The twine goes perfectly with that sentiment. Gotta get me some twine! what a bright happy card! I just posted on Wendy P's blog, there is nothing a rainbow can't fix!!! Great card Jingle. I hope you're on the mend!!! WOW! What a great way to incorporate that twine into the sketch, love it! So fun! Love this concept, Jennifer! 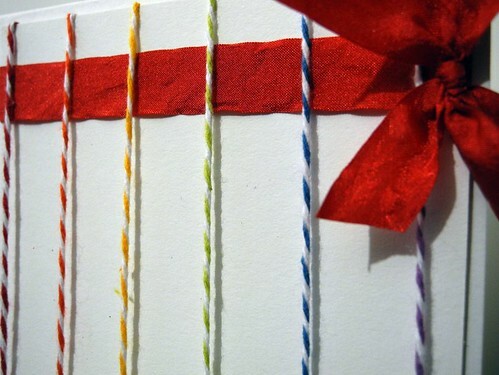 Such a bright and colorful card and that twine is to die for! The twine and that sentiment are PERFECTION! Jingle......I love your "twiney" card (yep, I'm creating words right here on YOUR blog........lol). I'm glad you are feeling a little better.